After enjoying a hearty Thanksgiving dinner with your loved ones, perhaps you'll gather 'round the TV to watch Thursday Night Football, or regale each other with family stories over cups of coffee and homemade pumpkin pie. Or maybe you'll just take your turkey and pie to go, as you high-tail it to your nearest shopping destination. 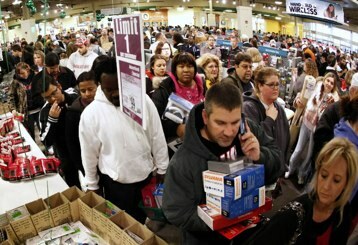 Black Friday has become an event that's no longer confined to 24 hours. It's now a days-long affair, and it seems to start earlier every year. This year, several retailers plan to open their doors well before the "typical" Black Friday early — between 3 and 7 am. This year, shoppers can expect stores to usher in crowds at midnight on Black Friday ... or even sooner. Some merchants are opting to kick off in-store sales on Thanksgiving Day, which may soon be better known as "Black Thursday." 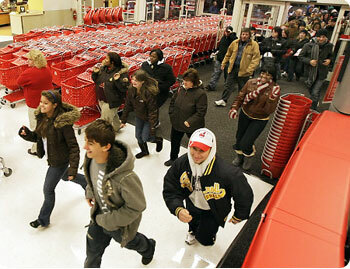 Target announced at the end of October that it would be opening its doors at midnight on November 25. Shortly thereafter, Macy's announced that its retail locations would do the the same. Other stores that will open their doors as soon as the clock strikes 12 include Best Buy (which opened at 5 am last year), Kohl's, Bon-Ton, HHGregg, and Shopko. Not to be outdone, Toys "R" Us and its sister store, Babies "R" Us, will welcome consumers as early as 9 pm on Thanksgiving, an hour earlier than last year. (Store hours will vary by location, with a bulk of stores opening at 10 pm.) 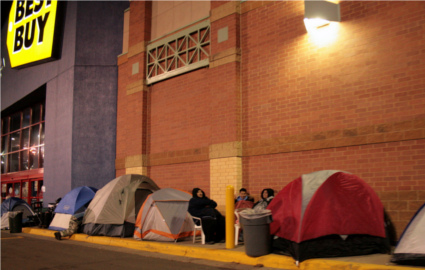 Walmart, meanwhile, will commence its Black Friday specials at 10 pm. Plenty of stores will wait until it's closer to sunrise to unlock their doors; for instance, you can count on JCPenney to be open at 4 am Friday morning, per usual. Simply put: It's a competition. Black Friday is a consumer marathon, and retailers are striving to be that first shopping oasis available for the weary yet willing holiday shopper. As Marshal Cohen, Chief Retail Analyst at the NPD Group told ABC News: "It's a race for space. If retailers can be the first doors open, they're going to capture that enthusiastic Black Friday customer." Extended Black Friday hours are also a result of preparing for lowered expectations in retail spending. As SmartMoney reports, the National Retail Federation projects a meager 2.8% rise in consumer spending in December (down from last year's 5.2%). In addition, SmartMoney also notes that just 18% of consumers plan to venture out on Black Friday — a nine point drop from last season. Stores being open for almost an entire day may entice shoppers to work off their turkey dinners by perusing the aisles and ultimately opening their wallets. From an economic standpoint, the choice to open stores ahead of schedule may prove advantageous. But on a more personal level, it's not without opposition. For both consumers and retail employees, midnight openings on Black Friday will mean having to leave the dinner table even sooner Thursday evening. That's not an extremely popular decision for those who especially value a family-centric holiday like Thanksgiving. Anthony Hardwick, a Target employee from Omaha, NE, created an online petition requesting his employer relent and open at 5 am Black Friday instead. "A midnight opening robs the hourly and in-store salary workers of time off with their families on Thanksgiving Day," Hardwick says. 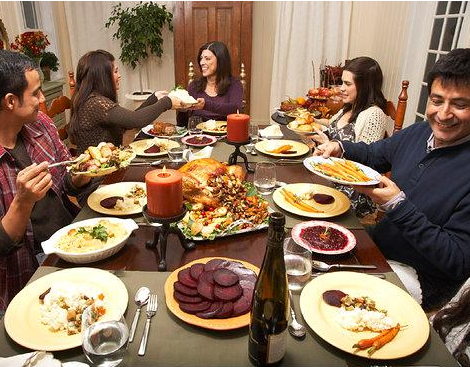 "All Americans should be able to break bread with loved ones and get a good nights [sic] rest on Thanksgiving!" Best Buy CEO Brian Dunn recently told the Wall Street Journal that it was pressure of keeping the pace with rival companies that led him to make the "difficult decision" to open shop early, one which made him "feel terrible." Meanwhile, Sears has opted to open its doors "later" since customers proclaimed that they'd sooner take advantage of the store's free in-store pickup option online, reports The Courier-News. Still, not all are against this trend. Per the New York Times, Macy's employees "appreciate the flexibility" it affords their holiday schedules. According to Advertising Age, Bon-Ton opted to open its stores at midnight per customer feedback. There is still plenty of buzz to be had for these midnight openings, and plenty of shoppers (and retailers) are willing to make any sacrifices to get there first. Should You Set Up Camp? While those shops opening as early as Thanksgiving Day may attract the premier group of enthusiastic consumers this holiday season, they may not yield the best or even the most exclusive deals. So don't feel guilty if, on Thursday evening, you elect to kick your feet up on the ottoman and sleep off your meal instead. Of course, you can still remain well-informed on the best Black Friday deals by downloading the dealnews Black Friday App for iPhone or Android. You can also set up an email alert if you're looking for a specific gift for that special someone (even if that "someone" is you). Its official starting next year there will be no black Friday. Everyone will start on Thursday, Thanksgiving. Old Navy opens most of its stores at 9am Thursday. They call it a 3 day sale.